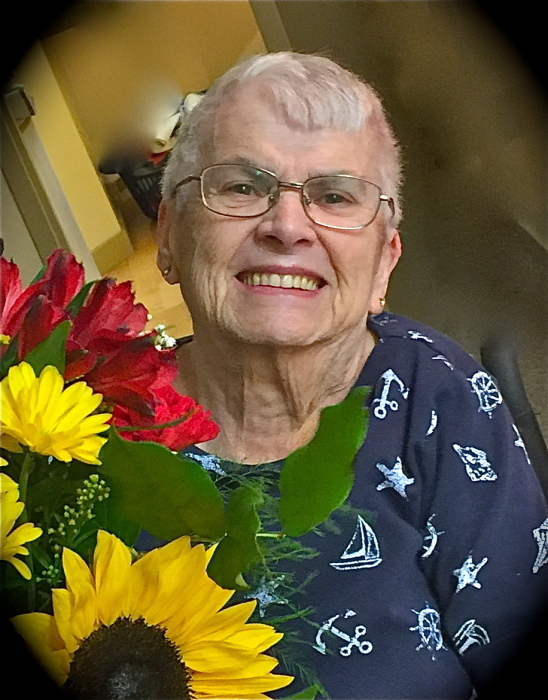 It is with great sadness that we announce the passing of Betty McKenna, formerly of Hillcrest Mines, who was called into the arms of our Lord on April 2, 2019 at the Good Samaritan Vista Village in Pincher Creek. She was blessed with 84.97 wonderful years. Betty was born on April 12, 1934 in Lemsford, Saskatchewan to proud parents, Harry and Rose Becker. She had a beauty and grace that endeared her to many but her heart belonged to a dashing and charismatic gentleman, Earl McKenna, and they pledged their love with marriage and devotion for almost 64 years. They enjoyed traveling, camping, family reunions, cards, over-decorating their house at Christmas and other special holidays, and spoiling their grandchildren. Betty enjoyed crocheting and knitting, feeding anyone who would stop by, and playing the occasional prank on her friends. She loved to laugh and never forgot a family member’s birthday. She realized that family and faith are the cornerstones of a happy life and she was truly blessed. Although our hearts ache to say farewell to a life that meant so much to us, we take comfort in knowing she is dancing in the strong arms of her beloved Earl once again. Left to mourn her passing and celebrate her life include her devoted sons, Brian (Darlene) McKenna, Kevin (Faye) McKenna and Darrell (Melinda) McKenna; her treasured grandchildren, Jillian (Shaun) Hoogstraten, Jain (Craig Miller) McKenna, Jesse (Meagan Morency) McKenna, Randi (Geoff) Eseltine, and Nikki (Jon Morgantini) McKenna; her cherished great granddaughter, Parker McKenna Eseltine; her dear sister, Maureen (Cyril) Bender; as well as her extended family and many friends. She was predeceased by her husband, Earl McKenna; her parents, Harry & Rose Becker; her grandson, Jeffree McKenna; her brothers, George (Kay) Becker and Pete (Eileen) Becker; several in-laws, extended family and her canine companions, Buddy, Lady, Sam, Peppy, Snoopy & Kipp. The Memorial Mass will be held at 11:00am on Saturday, May 11, 2019 at the Holy Trinity Catholic Church (13126 – 21 Ave., Blairmore, AB) with Fr. Angelo D’Costa and Fr. Myles Gaffney as Celebrants. Interment followed in St. Anne’s Catholic Cemetery in Blairmore. In lieu of flowers, memorial donations will be gratefully accepted by the Legion Poppy Fund. Condolences may be registered at www.fantinsfuneralchapel.ca. Our heartfelt appreciation goes out to the matrons at Vista Village for their compassion and care. There's still time to send flowers to the Memorial Mass at the Holy Trinity Roman Catholic Church at 11:00 AM on May 11, 2019.